Overview: Recapture the rivalry between knight and dragon in this age old battle, but with a real twist in the tail. In Dragon's Loot, players engage in a fiery battle with a green and toothy beast, in order to find a way into the mysterious dragon's lair, where glittering treasures lie within. Dragon's Loot features sharp modern graphics, with a handsome knight, castles, weapons and a cute maiden - all setting the scene for a rewarding path. The knight is the Wild and substitutes for most symbols, and when three or more dragon symbols spin up on any reel; the Dragon's Loot bonus feature is triggered - sweeping the player into the murky depths of the dragon's lair, which presents a rich selection of 5 treasures! 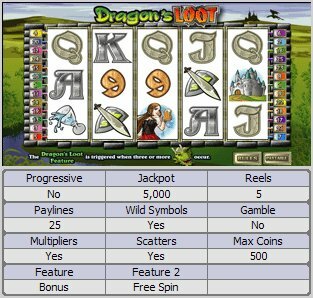 Similar Slots: If you like Dragons Loot, you might like these other 5-reel slot machines: Alaskan Fishing, K9 Capers, Munchkins, Retro Reels, Steinfest.